NVU brings you the 78-88 Olds Cutlass instrument packages. Built around NVU's tried and true Period styled and themed instruments in air core perimeter lighting or Full sweep stepper motor with LED backlighting, several bold and exciting styles will bring your dash to the next level while monitoring the vitals. The mounting solution bolts in place of the stock cluster (some trimming behind the scenes required for clearance not visible when installed). Bracket assembly features NVU's exclusive CNC laser ABC/Polycarbonate laminate printed icons with LED lights for a professional look. Installs in the factory location using all OE mountings. ( clearancing of back plate required not visible when installed. NVU's exclusive dead-fronted mounting panel hides the indicators when off, then clearly lights the icons when on. 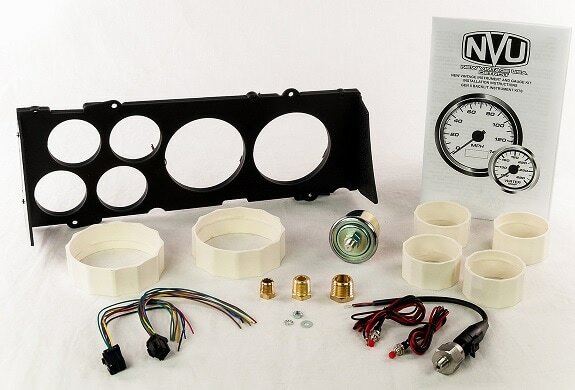 Each package includes speedometer, tachometer, voltmeter, water temperature, oil pressure and a factory match 0-90 ohm fuel gauge. 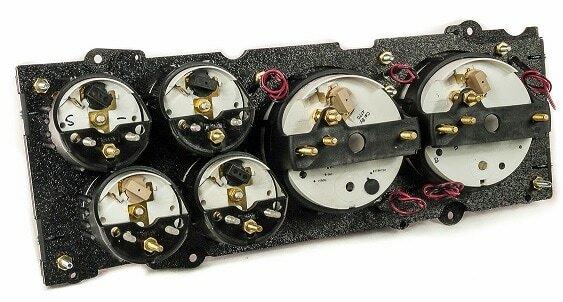 Kits are bolt-in and require wiring similar to any gauge kit, some splicing is required (not plug-and-play). Kits also include temperature sender, pressure sender, bushing kit and detailed instructions. Oil pressure and water temperature senders. Aviator, CFR and Performance II series instruments bring a new level of design, technology and features to the aftermarket. Exotic muscle graphics incorporating textures and colors in a way that says high-class, high tech and performance all at the same time. Textured inner dial with colored accents and bold numbers will make your dash stand out. Great for any resto-mod or pro-touring build. Topped with waterproof lenses and stainless bezels, the CFR series is sure to get your attention while monitoring vital components. Any build that demands exotic, high tech design will set the bar for dash design with the CFR series instruments.